On Wednesday (June 29, 2016) the yield on the 10-Year Treasury closed at 1.477%. This entry was posted in Uncategorized and tagged 10-year Treasury yields on June 30, 2016 by Ted Kavadas. The St. Louis Fed’s Financial Stress Index (STLFSI) is one index that is supposed to measure stress in the financial system. Its reading as of the June 23, 2016 update (reflecting data through June 17) is -.868. Of course, there are a variety of other measures and indices that are supposed to measure financial stress and other related issues, both from the Federal Reserve as well as from private sources. 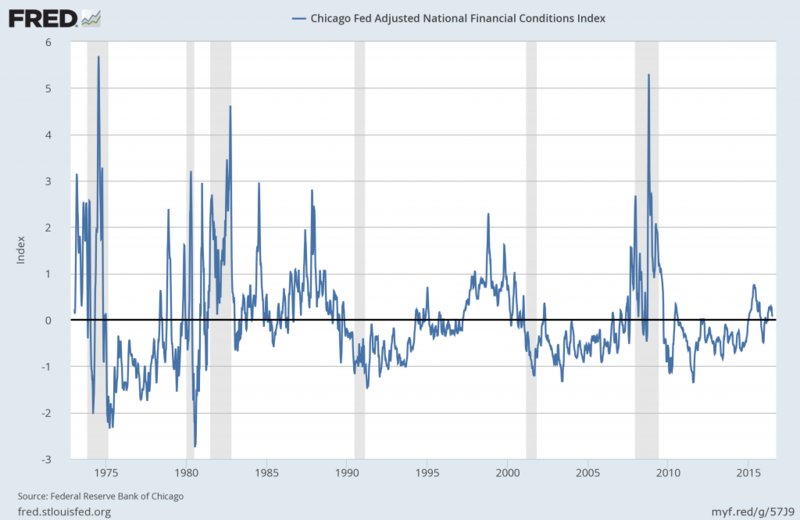 Two other indices that I regularly monitor include the Chicago Fed National Financial Conditions Index (NFCI) as well as the Chicago Fed Adjusted National Financial Conditions Index (ANFCI). 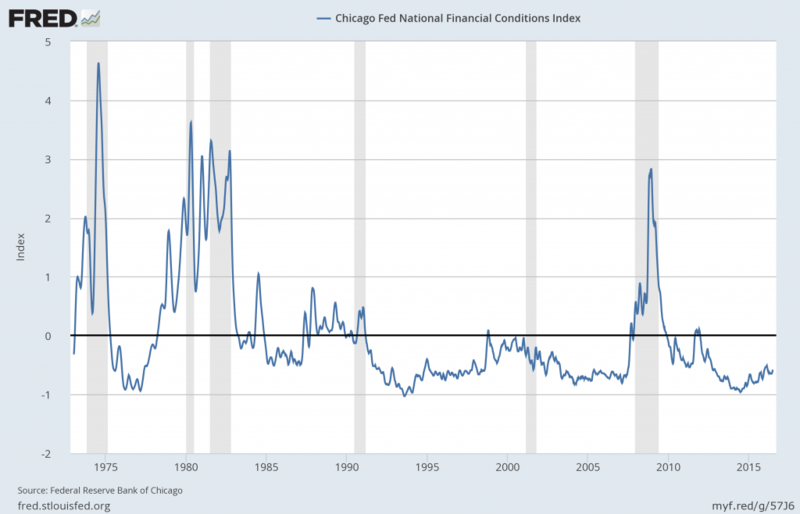 The National Financial Conditions Index (NFCI) measures risk, liquidity and leverage in money markets and debt and equity markets as well as in the traditional and “shadow” banking systems. Positive values of the NFCI indicate financial conditions that are tighter than average, while negative values indicate financial conditions that are looser than average. The adjusted NFCI (ANFCI). This index isolates a component of financial conditions uncorrelated with economic conditions to provide an update on how financial conditions compare with current economic conditions. Below are the most recently updated charts of the NFCI and ANFCI, respectively. This entry was posted in Economic Forecasts and tagged ANFCI, economic indicators, NFCI on June 29, 2016 by Ted Kavadas. This post is an update to past posts regarding stock market volatility. While I track many different measures of volatility, I find the following charts to be both simple and clear in depicting the recent volatility in the stock market. Overall, my analyses indicates that there are many reasons for this volatility, and the volatility is highly significant. For reference purposes, shown below are four charts with y-axis price labels. This entry was posted in Investor, Stock Market and tagged S&P500, Stock Market on June 29, 2016 by Ted Kavadas. Recently Deloitte released their “CFO Signals” “High-Level Summary” report for the 2nd Quarter of 2016. How do you regard the current and future status of the North American, Chinese, and European economies? Forty percent of CFOs describe the North American economy as good or very good (41% last quarter), and 39% expect better conditions in a year (up from 35% last quarter). Nine percent regard China’s economy as good (same as last quarter), and 10% expect improvement (down from 11%). Six percent describe Europe’s economy as good (up from 5%), and only 15% see it improving in a year (down from 17%). Page 8. What is your perception of the capital markets? Fifty-six percent of CFOs say US equity markets are overvalued (up dramatically from 30% last quarter). Eighty percent say debt is currently an attractive financing option (up from 68%), and 30% of public company CFOs view equity financing favorably (up from 22% last quarter). Page 9. Compared to the past 12 months, how do you expect your key operating metrics to change over the next 12 months? * Revenue growth expectations rose from 3.3% to 4.0%, but are still among their survey lows. Earnings growth expectations rose to 7.7% from last quarter’s survey-low 6.0%. Capital spending expectations rebounded strongly from last quarter’s survey-low 1.7% to 5.4%. Domestic hiring growth expectations rose to 1.1% from last quarter’s survey-low 0.6%. Pages 11-13. *Averages are means that have been adjusted to eliminate the effects of stark outliers. This quarter’s net optimism¹ of +30.0 marks a sharp reversal from declining sentiment that left last quarter’s measure at +1.7—the lowest level in more than three years. Sentiment is net-positive across all industries, with both Manufacturing and Energy/Resources posting significantly more optimism than they did last quarter. Consistent with this reversal, CFOs’ expectations for revenue, earnings, capital spending, and domestic hiring all rebounded from last quarter’s mostly dismal levels. But the gains for some metrics were modest. Revenue growth expectations, for example, rose from last quarter’s 3.3%* to 4.0%,* but remain relatively low. Moreover, nearly all industries continue to show weakness, with Manufacturing again lowest. Similarly, earnings growth expectations rebounded from their survey-low 6.0%* last quarter to 7.7%*—better, but still well off the long-term average. All industries expect positive growth (with Energy/Resources and Healthcare/Pharma highest and Manufacturing improving), but most are still comparatively low. Domestic hiring growth expectations rose to 1.1%* from last quarter’s survey-low 0.6%,* but they are still relatively low as well. Energy/Resources, Manufacturing, and Services were all below 0.5%. Capital spending is the bright spot, rebounding strongly from last quarter’s survey-low 1.7%* to 5.4%*—the highest level since the second quarter of 2015. Expectations for Manufacturing improved, but Energy/Resources again lagged. What are CFOs’ expectations for their companies’ year-over-year revenue and earnings? • Last quarter’s revenue growth expectations were 3.3%, only slightly above the 2Q15 survey low of 3.1% and well below the prior quarter’s 5.9%. This quarter’s expectations improved to 4.0%, but are still among the lowest levels in the survey’s history. The median expectation rose from a survey-low 3.0% to 4.0%, and just 72% of CFOs expect yearover-year gains (a new survey low). The distribution² of this quarter’s responses is among the widest on record. • Country-specific expectations are 3.7% for the US (up from 3.3% last quarter), 3.1% for Canada (up from 2.2%), and 8.6% for Mexico (up from 4.5%). • Industry expectations are mostly low, with Manufacturing lowest at 2.1% (up from 0.7% last quarter) and Energy/Resources at 3.1% (even with last quarter). Technology and T/M/E are the only industries above 6%, at 6.7% and 6.9%, respectively. • This quarter’s earnings growth expectations came in at 7.7%, significantly above last quarter’s survey-low 6.0%. The median rebounded from 5.0% to 7.0%, but the percentage of CFOs expecting year-over-year gains fell from 79% last quarter to just 76%—a new survey low. The distribution² of responses was well above the two-year average. • Country-specific expectations are 7.3% for the US (up from 6.4% last quarter), 9.4% for Canada (up from 4.2%), and 9.7% for Mexico (up from 3.1%). • All industries expect positive growth, with Healthcare/Pharma and Energy/Resources highest at 11% and 10%, respectively. Manufacturing improved from 5% to 8%. Technology and Services are again comparatively low at around 6%. All averages have been adjusted to eliminate the effects of stark outliers. “Distribution” refers to the spread of the middle 90% of responses. What are CFOs’ expectations for their companies’ year-over-year hiring? • Domestic hiring expectations rose to 1.1%, up from last quarter’s survey-low 0.6% and consistent with 2015 levels. The median rose from 0.0% to 1.0%, a bit above the survey average of 0.7%. The proportion of CFOs expecting gains rose from 47% to 55% and is back near the survey average. The distribution² of responses is about average compared to recent quarters. • Country-specific expectations are 0.9% for the US (above last quarter’s 0.7%, but still at the second-lowest level in three years), 0.9% for Canada (up from – 0.9% last quarter), and 3.9% for Mexico (up from 2.7% last quarter). • Technology, T/M/E, and Retail/Wholesale are highest at 3.2%, 2.7%, and 2.0%, respectively. Energy/Resources again indicated a contraction (-0.5%, which is about even with last quarter). Manufacturing and Services were also low, both with estimates below 0.5%. • Offshore hiring growth fell to 1.8%, down slightly from last quarter’s 1.9% and the lowest level in three years. The median remains at 0.0%, and just 39% of CFOs expect year-over-year gains (down from last quarter’s 45%). • Country-specific expectations are 1.9% for the US (up slightly from 1.8%), 0.0% for Canada (down from 2.8%), and 1.6% for Mexico (up from 0.4%). • Technology again indicates the highest expectation at 4.0% (up from 3.4%), with Energy/Resources and Healthcare/Pharma the lowest at 0.0% and 0.5%, respectively. • Domestic wage growth rose to 3.1%, up from last quarter’s 2.5%. The median held at 3.0%, and 96% of CFOs expect year-over-year gains. • Country-specific expectations are 3.1% for the US (up from 2.5%), 2.2% for Canada (up from 2.1%), and 4.6% for Mexico (up from 4.1%). • All industry-specific expectations are between 2.6% and 3.9% (versus 2.2% and 3.1% last quarter), with Energy/Resources and Healthcare/Pharma on the low end and Technology highest. Please see full report for industry-specific findings. Which external and internal risks do CFOs regard as most worrisome? • Still-rising commodity price worries: After climbing significantly last quarter, worries about oil and other commodity prices continued to rise this quarter. • Continuing concerns about broader global economic volatility: For the last two quarters, CFOs’ concerns appeared to shift from a specific focus on Europe and China to a more generalized focus on global economic stagnation and volatility. This trend largely continue this quarter, but was offset somewhat by rising concerns about the US economy. • Sharply rising concerns about the US economy: Where last quarter’s rising concern was driven mostly by worries about the effects of struggling equity markets on consumer demand, this quarter’s rise appears driven by worries about US political and policy uncertainty as the 2016 elections approach. • Sharply rising election and policy concerns: Regulatory concerns are again strong and industry dependent. US presidential election worries skyrocketed this quarter, with CFOs citing growing uncertainty around international trade, government spending, and tax policy. • Declining concerns about financial markets: With equity markets having mostly recovered since last quarter’s survey, concerns about financial markets declined this quarter. Concerns about interest rates and a strong dollar continued, however, and worries about global debt levels (for both China and elsewhere) emerged as a growing concern. • Consistent talent challenges: Concerns around retention, an aging workforce, and leadership turnover continued this quarter. • Escalating growth and execution concerns: CFOs voiced growing concerns about finding growth opportunities, executing their growth initiatives, innovating, and executing against their strategies and plans. Among the various charts and graphics in the report are graphics depicting trends in “Own Company Optimism” and “Economic Optimism” found on page 6. I post various business and economic surveys because I believe they should be carefully monitored. However, as those familiar with this blog are aware, I do not necessarily agree with many of the consensus estimates and much of the commentary in these surveys. This entry was posted in Business and tagged Business on June 29, 2016 by Ted Kavadas. There are a few aspects of the above charts that I find highly noteworthy. Of course, until the recent sudden upswing, the continued subdued absolute levels of these two surveys was disconcerting. While I don’t believe that confidence surveys should be overemphasized, I find these readings to be very problematical, especially in light of a variety of other highly disconcerting measures highlighted throughout this site. This entry was posted in Uncategorized and tagged Consumer Confidence on June 28, 2016 by Ted Kavadas. The subject of deflation contains many complex aspects, and accordingly no short discussion can even begin to be a comprehensive discussion of such. However, in this post I would like to highlight some recent notable developments. Our inflation outlook also rests importantly on our judgment that longer-run inflation expectations remain reasonably well anchored. 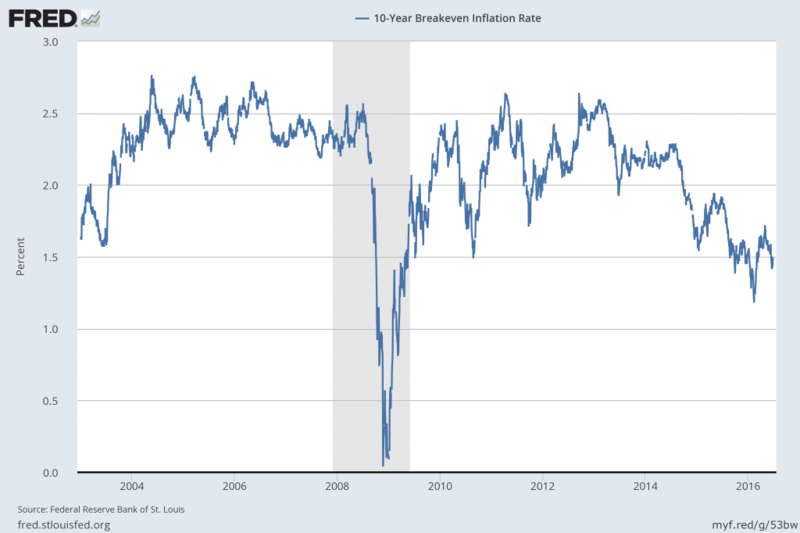 However, we can’t take the stability of longer-run inflation expectations for granted. While most survey measures of longer-run inflation expectations show little change, on balance, in recent months, financial market-based measures of inflation compensation have declined. Movements in these indicators reflect many factors and therefore may not provide an accurate reading on changes in the inflation expectations that are most relevant for wages and prices. Nonetheless, in considering future policy decisions, we will continue to carefully monitor actual and expected progress toward our inflation goal. Trying to assess and/or predict the possibility of U.S. deflation is very challenging for many reasons. Among these reasons is that there are many different measures that are supposed to predict and/or depict the possibility of deflation, and they can show apparently contradictory readings. Among these measures are both survey-based as well as market-based measures. As mentioned above, the continuing inability to “create” inflation to rise above the 2% goal. Prolonged and pronounced economic low- and no-growth levels experienced globally. While there is widespread consensus that U.S. economic growth will remain positive for the foreseeable future, my analyses indicates that the economy continues to have many highly problematical areas and that the widespread consensus concerning current and future economic growth is (substantially) incorrect. Substantial economic weakness (i.e. contraction) and deflation often occur simultaneously. Continual indications of “deflationary pressures.” I have written extensively concerning these persistent “deflationary pressures,” which have manifested in a variety of areas. The breakeven inflation rate represents a measure of expected inflation derived from 10-Year Treasury Constant Maturity Securities (http://research.stlouisfed.org/fred2/series/DGS10 ) and 10-Year Treasury Inflation-Indexed Constant Maturity Securities (http://research.stlouisfed.org/fred2/series/DFII10 ). The latest value implies what market participants expect inflation to be in the next 10 years, on average. Disconcerting readings and trends from the State Street PriceStats Inflation Series. An additional concern is the seemingly (very) high levels of inventory, as seen in various measures, such as Total Business: Inventories to Sales Ratio (currently seen at 1.40 as of the April 2016 reading, updated as of June 14, 2016.) While, for many reasons, it is difficult to know how much of a future problem this seemingly elevated inventory level is, it definitely has the potential to be highly problematical and a substantial “driver” of future price deflation, especially during an economic contraction. It should be noted that there are many other measures of current and future inflation that imply little or no worrisome trends. However, as I have mentioned previously, the methods in which deflation “plays out” is not necessarily incongruent with various indicators seemingly indicating little chance of deflation prior to a deflationary period. In conclusion, I continue to believe that significant (in extent and duration) U.S. deflation is on the horizon. As discussed in the November 14, 2013 post (“Thoughts Concerning Deflation”) deflation often accompanies financial system distress. My analyses continue to show an exceedingly complex and difficult future financial condition in which an immensely large “financial system crash” will occur, during and after which outright deflation will both accompany and exacerbate economic and financial conditions. This entry was posted in Uncategorized and tagged Deflation on June 28, 2016 by Ted Kavadas. 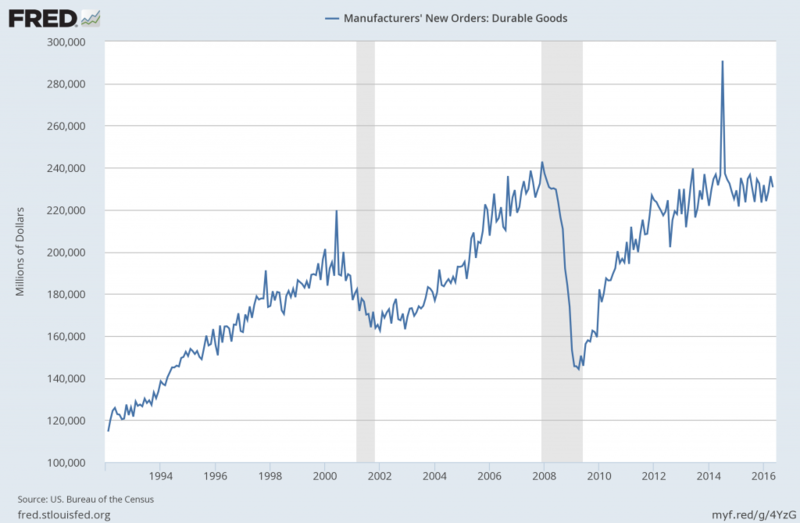 Many people place emphasis on Durable Goods New Orders as a prominent economic indicator and/or leading economic indicator. For reference, below are two charts depicting this measure. 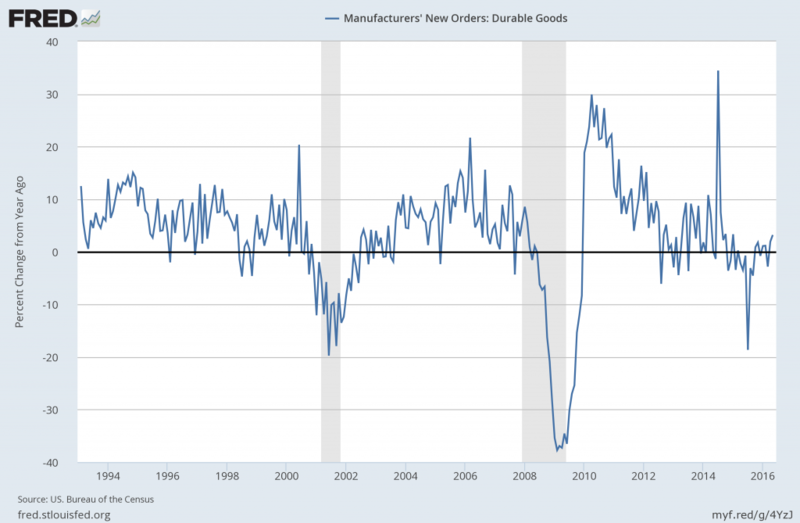 This entry was posted in Uncategorized and tagged economic indicators on June 24, 2016 by Ted Kavadas. I have written many blog posts concerning the worrisome trends in income and earnings. Doug Short, in his June 23, 2016 post titled “Real Median Household Income Declined Again in May” produced the chart below. It is based upon data from Sentier Research, and it shows both nominal and real median household incomes since 2000, as depicted. As one can see, post-recession real median household income (seen in the blue line since 2009) remains worrisome. As the excellent data from Sentier Research makes clear, the mainstream U.S. household was struggling before the Great Recession. At this point, real household incomes are about where they were during the middle of the Great Recession. Among other items seen in his blog post is a chart depicting each of the two (nominal and real household incomes) data series’ percent change over time since 2000. I post various indicators and indices because I believe they should be carefully monitored. However, as those familiar with this site are aware, I do not necessarily agree with what they depict or imply. This entry was posted in Uncategorized and tagged Household Income on June 24, 2016 by Ted Kavadas. 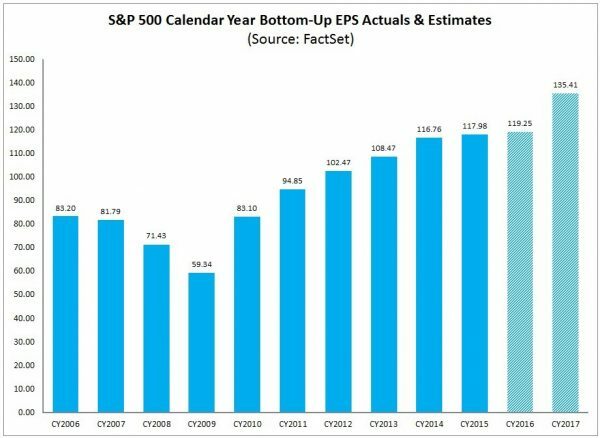 S&P500 earnings trends and estimates are a notably important topic, for a variety of reasons, at this point in time. 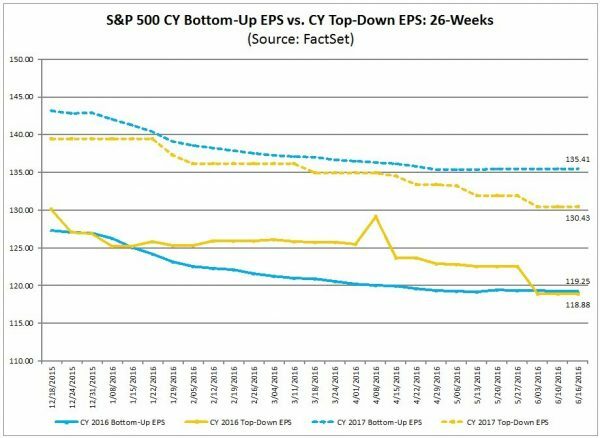 FactSet publishes a report titled “Earnings Insight” that contains a variety of information including the trends and expectations of S&P500 earnings. I post various economic forecasts because I believe they should be carefully monitored. However, as those familiar with this blog are aware, I do not agree with many of the consensus estimates and much of the commentary in these forecast surveys. This entry was posted in Investor, Stock Market and tagged S&P500, S&P500 Earnings, Stock Market on June 24, 2016 by Ted Kavadas. This entry was posted in Investor, Stock Market and tagged S&P500, S&P500 Earnings, Stock Market on June 23, 2016 by Ted Kavadas.